I just actually received an email about some unusual chocolate treats…one of them happens to be a jar of extreme goodness called Spoonfudge. 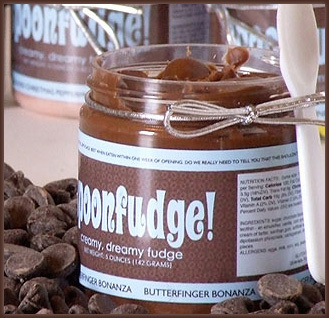 It is actually fudge in a jar with an attached spoon that you eat by the spoonful. Of course I had to try some so I ordered a set of chocolate caramel and chocolate peanut butter cup and dark chocolate and a marshmallow chocolate combo…four little jars in all…Spoonfudge was sweet enough to give me a 10% off code…blog1011…just type it into your order and you will get 10% off…enjoy!!! Fudge it too rich for me, but I bet my son would love this!